When I said I was giving up blogging for Lent, I had no idea that it would be this difficult. Sundays allow for what is otherwise abstained from during Lent, so I’ve been preparing a highlight post in hopes to give you a glimpse of the past week. You may want to grab a drink and a light snack. There’s no telling how long this might take. Kidding…. no seriously. Let’s begin with a pop quiz, shall we? b.) Take that as a sign that you should have given up alcohol instead of blogging for Lent? Let’s just say, you choose option “c”. You return to the market with proof of purchase, and explain to the new-hire behind the customer service desk that you’ve come to pick up your deserted brew. She makes a phone call, no doubt to someone with more power than she, and you hear her say, “No, she looks like a mom”. Gee, is it that obvious? A few moments later, a portly gentlemen with a pocket protector and a rather large set of keys appears to confirm that you do, in fact, “look like a mom” and that your story is plausible. You are cleared to enter the over-21 aisle and off you go with your drink of choice carefully stowed away in the front seat of your minivan. A few days later, your husband leaves town. You get ambitious and decide to clean out that overstocked storage closet that could single-handedly clothe a small village in Africa. You’re feeling pretty good about doing your part– removing the excess, giving to those less fortunate, finding your center… and so on. You open the hatch back to load your minivan with the bounty of sheer benevolence, when what is that peeking out from underneath a stack of CDs and a pair of jumper cables, but the original six-pack that you supposedly abandoned at the store on Monday’s market venture. a.) Determine that you somehow convinced yourself you must have dreamt that Shock Top was running a Buy 1 Get 1 special. I was nursing Mia on Saturday afternoon when my son decided to use my arm as a crash cymbal. I told him, “No drumming on mommy”. I think he’s clever enough to figure out that I am helplessly land-locked while I’m nursing because he did not heed the warning. I said, “Salem, go to time out”… thinking, “no two year old in their right mind is going to willingly put themselves in time out, much less the smelly trash corner.” Our time out zone is the hallway leading to the back patio where we keep the smelly trash before garbage day. I try to make the point that our smelly attitudes belong in the trash. I know. God only knows how much a therapist is going to bank out of that one day. Still, without so much as a fuss…. he went! I hear him from the back of the house saying, “Don’t hit mommy”… along with “I tooted”. Gotta love boys. After the above-mentioned “hypothetical situation” with the re-claimed six-pack, I hardly expect you to believe that I did not collect all of these wine corks by myself. 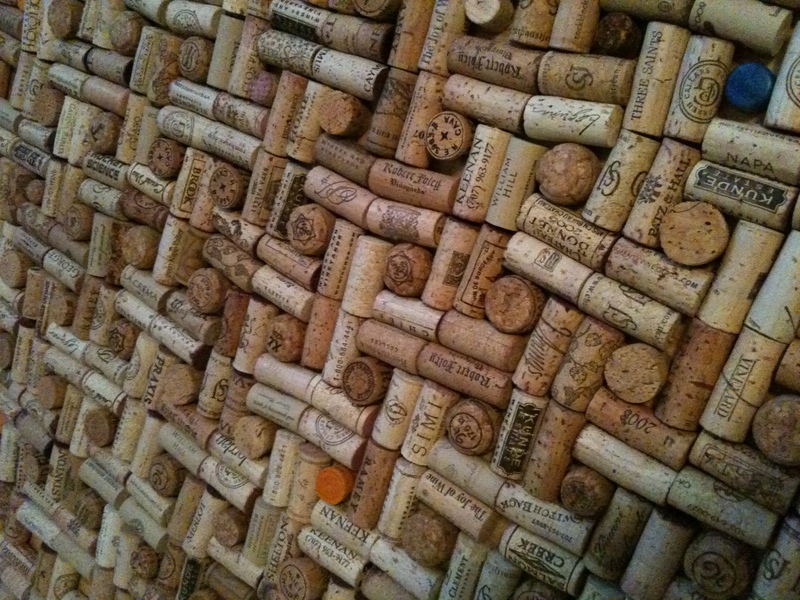 This particular wine cork board is for my church to post community announcements. I’m pretty sure we are going to be the only church in the history of churches everywhere in Charlotte that has an announcement board full of wine corks, but its like I always say, “Friends don’t let friends in ministry drink…alone.” I did not complete my project, but I did, however, learn a new word from my friend Kellie of Little Nummies blog. Have you ever heard anyone use the word “natty” ? According to Webster “natty” means, “neatly or trimly smart in dress or appearance; spruce.” Perhaps Kellie and I will start a campaign to bring back in style. Will you support our word cause? Stay tuned for another highlight post next Sunday! Until then… pop a cork (and send it to me), put your feet up, and surf the above sites. I know you’ll enjoy. See you next weekend! reading this was a highligh of Sunday evening! the beer story is the best! i have enjoyed laughing with you this evening, and look forward to laughing in person in just a few short weeks. Thanks Salina! I am sitting here having my breakfast…V8, ezekiel toast with peanut butter and 1/2 of an apple. Yes, I am changing my diet and feel amazing. Reading your blog was so much more fun than the morning news or the weather channel. I look forward to your daily blog reappearing in April. Love you sweetheart! Off to triple bun my hair and go to the dog park.